This list of Pilgrimage Site are the Verso Ministries Top Pilgrimage Sites in Region 7. The Regions that will be used for all of our lists are based off of the Regions used by the National Federation for Catholic Youth Ministry (NFCYM) and used for the Bishop Conferences. These resources are here for Youth Groups, Young Adults, and Individuals to be able to find local sites to go on Pilgrimage to. The Shrine of Our Lady of the Snows is the pride of the Diocese of Belleville in honor of one of the most ancient Marian apparitions. Our Lady of the Snows is the title imparted on Mary after the miraculous snowfall in Rome in 352 AD. Mary had appeared to a wealthy Roman couple and said that she desired a church to be built upon the hill that she would specify with a snowfall. On August 5th of that year, the snow fell just as she had promised and by the year 358 AD, the original form of the Basilica of Saint Mary Major was completed. Fast forward 1600 years to 1958 and the Missionary Oblates of Mary Immaculate who were stationed in southern Illinois sought a location to build a Shrine in honor of Our Lady of the Snows. Today, the expansive grounds are covered with smaller shrines to various apparitions of Mary as well as aspects of the life of Christ and the Church of Our Lady of the Snows. This is the ideal location for anybody in the southern half of Illinois, or even those across the river in Missouri. The large grounds are perfect for large groups of pilgrims to explore as well as enter into times of prayer and group reflection upon the mysteries encapsulated in the miracles provided by Our Lady. The Shrine is also only twenty minutes away from downtown Saint Louis, making it the perfect spot for a day trip from the big city for anybody visiting any of the sites on our list for Region 9! So take a trip to the Shrine and enjoy the opportunity to honor one of the less well known (but most important) appearances of Mary! Just as we hear in the Gospel, “What good can come from Nazareth?”, so to does the cry of Indiana go, “What good can come from Terre Haute?” And yet, for all Catholics of the state, it is well known that Terre Haute is home to the only Saint that our lovely state has to offer. Mother Theodore Guerin embodied the Catholic missionary spirit of the first half of the 1800’s as she led a small group of religious sisters into the backwoods of Indiana in order to help bring education to those that lived there. As her order grew, so too did the number of schools that they provided both to Indiana and eastern Illinois. The most famous of these became Saint Mary of the Woods College on which her Shrine finds its home. The Shrine itself is home to a vast museum documenting Mother Guerin’s life as well as the road to her canonization. This all leads up to her tomb which is held in its very own chapel at the end of the museum. It is as if you walk through Mother Guerin’s life, side by side with her, all the way to her grave. As a hoosier, there is something special about being able to meet a woman who was so greatly influential to the spread of Catholicism in the world and you cannot help but be struck by her trust in Divine providence. If there is anything you will take away from visiting her tomb and hearing her story, it will be that Providence Never Fails. So I encourage you to go and meet the woman of great faith and hope and allow yourself to be inspired by her! 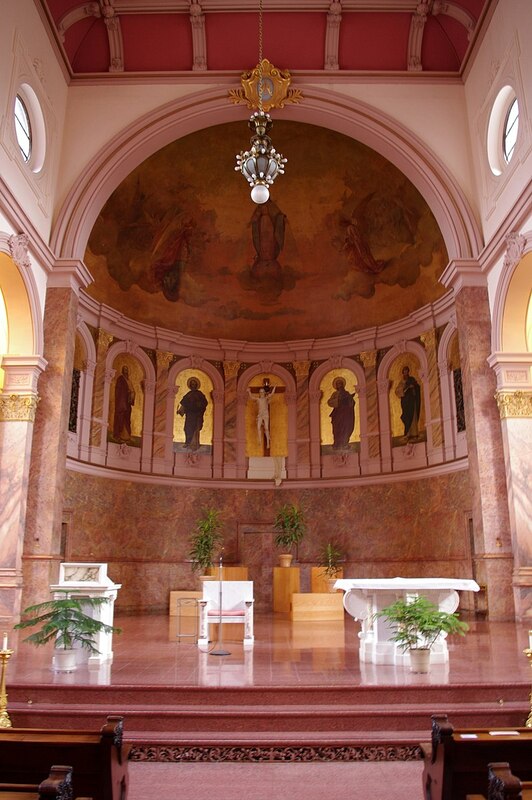 While you are there, make sure to also talk to the Sisters of Providence who carry on the work Mother Guerin entrusted them with and go spend some time in their glorious Adoration chapel in order to thank the Lord for the gift that is Saint Mother Theodore Guerin. The Shrine of Christ’s Passion in St John, Indiana is the home to some of the most striking and most lifelike Stations of the Cross you will ever encounter. Home to the perfect Lenten Pilgrimage (outside of visiting the Holy Land), you will find yourself walking the half mile stretch from the Last Supper all the way to Christ’s Resurrection. As you slowly walk up the hill to Calvary, the image of Christ on the Cross is burned into your heart as you recognize the great love he holds for you. Coming down the hill to the tomb, the anguish of loss fills you. And finally at the end, there is irreplaceable joy as the recognition of the Resurrected Christ takes away all of your sorrows and pains. This site was made for tour groups and it is easy to schedule a visit with their friendly and helpful staff. There is also the opportunity to peruse their expansive gift shop and if you time it right, go to Mass at Saint John’s Church at the top of the hill at the end of the path. With so many options for prayer, there is little excuse not to make this Shrine part of your Lenten experience this year! Saint Meinrad Archabbey is home to the most humble monks that you will ever meet. Having been founded in 1854 by monks from Einsiedeln, Switzerland these Benedictines have prided themselves in their charism of hospitality. Whether it be through education in the early days, hosting of retreatants, or even being a short refuge for the von Trapp family (yes, that von Trapp family), the monks of Saint Meinrad have sought to embody the ideals of their patron who gave up his life for the sake of hospitality. Today they are driven by daily communal prayer, the printing of books, and the higher education of members of the laity and seminarians from all over the country. It is a special place in the hearts of all who live in southern Indiana as the air of peace and tranquility in the presence of God transcends all that its visitors bring with in their own hearts. There are many opportunities for visitors to enter into prayer and enjoy a tour of the grounds as well as a retreat house for all who want to get away from the world to the serenity of nature. Not far off is the Shrine of Monte Cassino (also ran by the Monks) which allows this trip to be an easy double pilgrimage. And if you bring your kids along, Holiday World (the world famous theme park in southern Indiana) is just a short drive away! The Basilica Shrine of Mary, Help of Christians at Holy Hill is a Shrine built in honor of Mary and ran by discalced Carmelites. This beautiful Church sits on 435 Acres of wooded land and finds itself only 45 minutes away from Milwaukee. Open from the start of May to the end of October, this is the perfect summer pilgrimage site as the Church and grounds are made for large groups to come and join in on the intercessory prayers through Mary to Jesus. It is on these grounds that over 500,000 people come annually seeking the aid of the Blessed Mother and it is a great opportunity for any pilgrim to make a journey to offer up their own needs and desires, entrusting them to Mary who will bring them to her son. As a final aside, I strongly encourage that you plan your trip on a day with calm weather as on those days you are able to climb to the top of the tower for the best view in all of Wisconsin!